As the 21st century progresses, technology has somewhat taken a turn to cling to our bodies. Initially, we had desktop computers, which had their own station of residence (tables), and a user would just use them with a mouse and keyboard. Now, however, with the arrival of smartphones, tablets, and wearable computers, technology is becoming more to be like human organs, or it will become close to being like human organs in the near future. Ironically, that near future has already arrived, for the industry of wearable gadgets is taking big scientific leaps, and wearable gadgets have started to flood consumer markets. Jawbone, a private company, has unveiled UP24 wristbands which track how physically active their wearers are and how healthy they are eating or sleeping. The wristbands, upon monitoring their wearers, recommend their wearers healthier lifestyles by communicating with Apple devices over a wireless connection. How UP24 bands work is that they accumulate data through sensors on how their wearers eat, sleep among other activities. Upon gathering data, UP24 wristbands send the accumulated data to Jawbone’s servers where the data is analyzed, and recommendations are sent back to Apple devices (iPhone, iPad, iPod touch) of Up24 wristband wearers on how to pursue healthier lifestyles. The amazing fact about UP24 wristbands is that they reveal time-periods when their wearers are most lethargic or vapid, or when do they sleep best or worst, and then they suggest ways for improvement. Suggestions from UP24 wristbands encourage people to set activity goals for themselves, and in a situation in which the wearer is barely short of competing his or her goal, the UP24 wristband would recommend a random physical activity for the completion of the set goal. Reportedly, more than 100 app developers are working on apps that would function independently over the internet, without the user having to worry about his or her activity. UP wristbands have been Jawbone’s most successful products to date, and industry analysts have guessed soaring figures of UP wristbands’ sales, but the guesses could not be verified as Jawbone does not disclose sales figures. Previous versions of UP wristbands are sold for $130, and they need to be physically connected with devices for their synchronization, while UP24 wristbands are sold for $150. 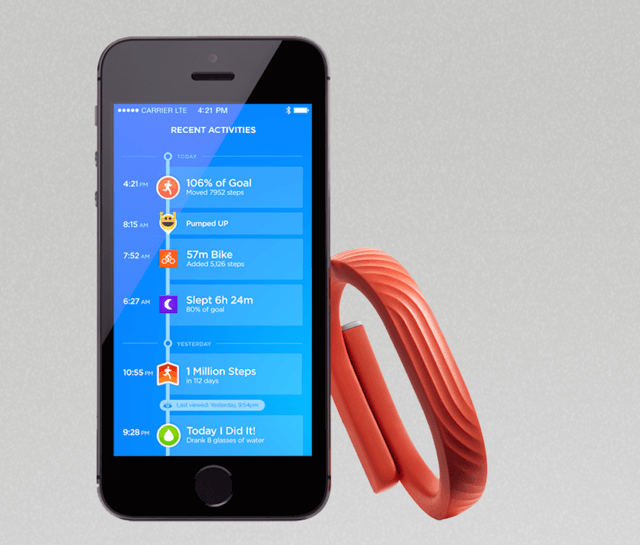 According to Jawbone, an application of UP24 wristbands will soon be released for Android devices also.